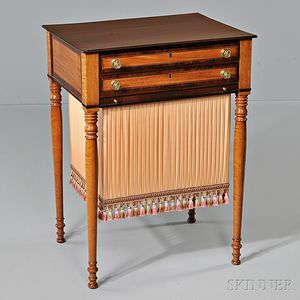 Federal Mahogany and Bird's-eye Maple Inlaid Worktable, Massachusetts, early 19th century, the top with double-beaded edge above crossbanded and string-inlaid case of two similarly inlaid drawers and a bag drawer incorporating applied double-bead, on turned figured maple legs ending in turned feet, ht. 30 1/2, wd. 22, dp. 18 in.